This room is our largest room. It leads onto a balcony and has a open plan large bathroom. 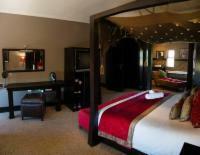 All our rooms have their own satalite tv decoder and this suite has a small living area. Dinner Only available from Monday to Thursday by prior arrangement. F Indulge in the character of this highly successful international soprano. King size bed with on suite bathroom - shower only. This room is situated in our garden with private entrance. Dinner is served Monday to Thursday by prior arrangement. If cancelling 14 days before arrival, forfeit 100% of the deposit. If cancelling 30 days before arrival, forfeit 50% of the deposit. If cancelling 999 days before arrival, forfeit 20% of the deposit. Altissimo & Andante Guesthouse Terms & Conditions 1. Reservations, Payment and Terms 1.1. Reservations are accepted on a 'per person' basis and not a room basis. Rates are therefore subject to the number of people that occupy a room. The names and relationship to the Guest of the additional persons sharing the room must be provided when the reservation is made. Children from the ages of 0-4 stay free of charge. 1.2. Bookings can only be confirmed if the guesthouse receives a 50% deposit on accommodation, or valid credit card details with authorization to debit, along with the Guest name, surname, number of persons sharing each room, cell phone number of the Guest, confirmed payment method and expected time of arrival of each Guest. 2. Arrival and Departure 2.1. Check in time is between 14:00 and 20:00 unless prior arrangements have been made. No check-in will be made after 21:00, unless arranged with management. This is necessary to ensure the security, comfort and well being of other guests. 2.2. Check out time is at 10:00 unless prior arrangements have been made. No check-out after 11:00. This is to enable the room to be prepared in time for new arrivals. Guests that check out after 11:00 without prior arrangement will be liable for an extra night's Accommodation, as we will not be able to service the room in time for new arrivals. 2.3 At check-in, the Guest must present the credit card used to make the online booking 3. Service Hours 3.1. The reception desk is open from 07:00 to 17:00 Monday to Fridays and 08:00 to 10:00 on weekends and public holidays. The after-hours contact number is 079 889 5849 3.2. Reservations office hours are: Monday to Friday from 08:00 to 17:00. Afterhours you may phone 079 889 5849 3.3. Subject to availability of rooms, persons interested in booking accommodation and wishing to view the guest house beforehand may do so provide a room is vacant. 4. Security & Storage 4.1. Although the guesthouse takes reasonable steps to ensure the safety and security of Guests and their possessions, Guests retain final responsibility for their own safety and security. Keep rooms locked at all times and place valuables in the safe provided. Upon check out please leave the safe open and room locked. 4.2. The guesthouse does not provide storage facilities for personal belongings or vehicles. 5. Loss or Damage to Guest House Property The Guest retains personal liability for any loss or damages caused to the property of andante and Altissimo Guesthouse (excluding wear and tear). 6. General Incapacity The guesthouse cannot be held liable if any of the following events or conditions prevents the guesthouse from fulfilling its obligation to Guests. The guesthouse will take all reasonable steps to minimize disruption and discomfort to Guests under these conditions. 6.1. Unanticipated interruption to the electricity, water, sewage from or on the guesthouse property. 6.2. Industrial action, civil uprising or criminal activity. 6.3. Fire, frost, flooding, subsidence or any other force majeure event.